Setting out to redesign your most popular full suspension bike must be an incredibly daunting task. Get it right, and you can potentially turn a great bike into an even greater bike. Get it wrong however, and you have a very real risk affecting a substantial portion of your sales. Pivot Cycles isn’t exactly a brand that does things half-arsed just for the sake of it though. 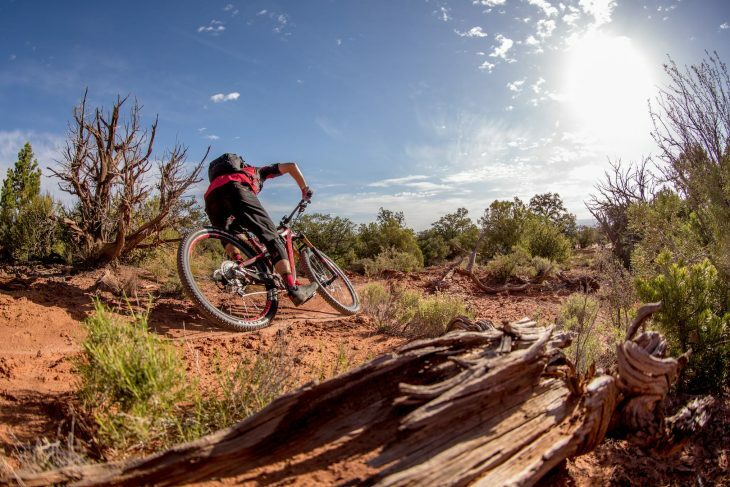 And in this case, the Arizona-based company has decided to throw caution to the wind with its move to replace the Mach 429 Trail with an entirely new bike called the Trail 429. But let’s wind things back a bit. I recall the launch of the original Mach 429 Trail well. It was held in Park City in Utah back in summer of 2015, where I had the chance to take the new bike out with Pivot Cycles’ CEO and lead designer, Chris Cocalis, on the incredible Mid Mountain trail. 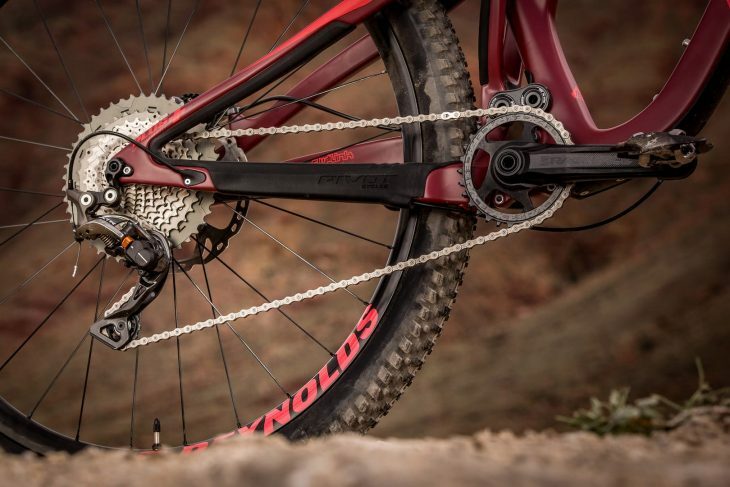 The bike was particularly progressive for a 29er trail bike at the time, being the first Pivot bike to feature both Boost 148x12mm hub spacing and 27.5+ compatibility. I got along well with the Mach 429 Trail. It pedalled well and felt energetic to ride, but I was particularly impressed with just how planted its suspension felt on the descents given it only had 116mm of rear travel. 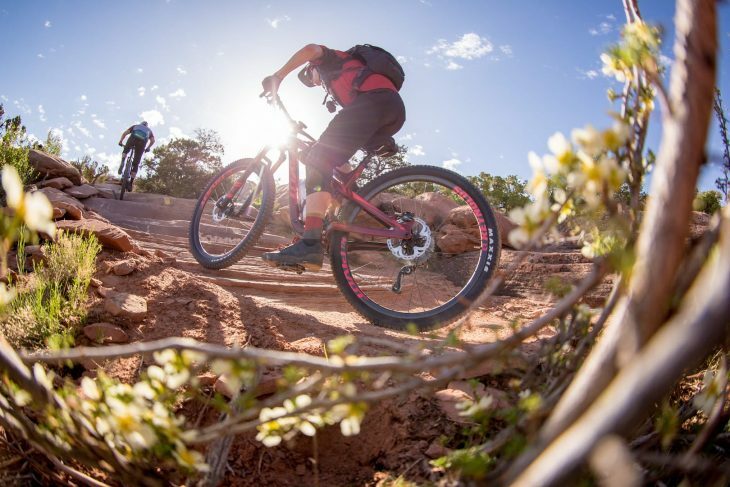 The Mach 429 Trail went on to win an Editor’s Choice Award, and it also proved to be popular with consumers too, established itself as Pivot’s best-selling full suspension bike over the past three years. Nothing lasts forever though, and with three years being the typical lifespan for a high-end carbon frame, 2018 has shaped up to be the year for a redesign. When I received an invitation from Pivot for this launch, I had my suspicions that it would be a new Mach 429 Trail. What I didn’t expect was the name change. The new Trail 429 from Pivot Cycles. Photo: Jens Staudt. Chris Cocalis explained that this decision was made due to the confusion that existed between the Mach 429 SL and the Mach 429 Trail. I never had an issue with it personally, but apparently there have been some dealers in the US who have ended up ordering the wrong bike. 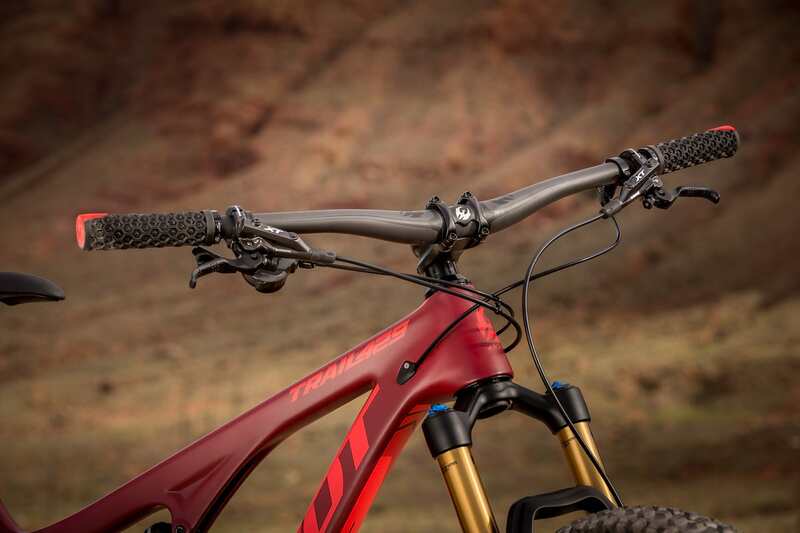 The Mach 429 SL remains in the Pivot lineup as normal, but to better separate the two, this new bike drops the Mach label and is now simply renamed the Trail 429. The bike itself is still a short travel 29er, but it features an entirely new carbon fibre frame with a slew of updates. 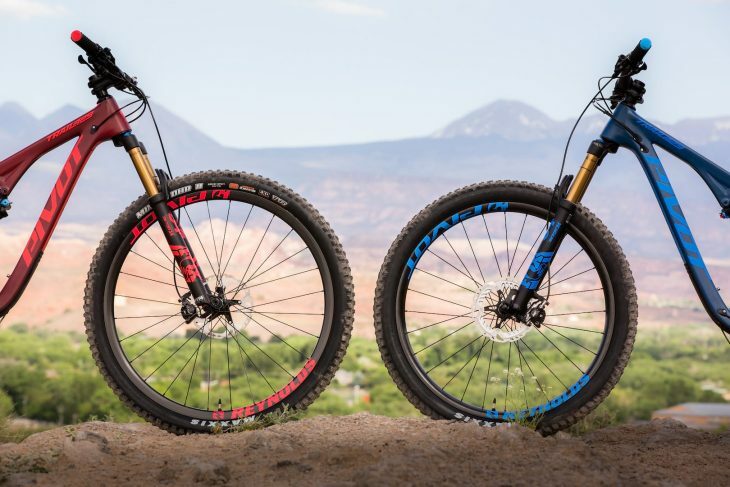 There have also been some subtle changes to the geometry and suspension design, and though the old bike could take 27.5+ wheels, the new version offers more convincing compatibility for fitting plus-size rubber. To experience what the new Trail 429 is all about, I was invited out to Moab in Utah to put the bike to the test. On a personal level, this was a super exciting experience, as it would be my first time riding in Moab. On a professional level, it would also prove to be an excellent test of a brand new bike on completely unfamiliar and highly technical terrain. Replacing the Mach 429 Trail, this is Pivot’s brand new short travel 29er. Photo: Jens Staudt. Pivot has seriously stepped up its game in the style stakes. Photo: Jens Staudt. Pivot Cycles has always been a ‘function over form’ kinda brand. But the latest models are bucking that trend by pairing excellent chassis and suspension performance with killer industrial design. The Mach 5.5 is one such bike, and the Trail 429 borrows similar shapes and profiles, with an almost straight line carried down from the headtube to the rear axle. Combined with the matte two-tone paint jobs, I think it’s a very good looking bike. The muscular carbon frame gets an all-new layup over the Mach 429 Trail, with both the mainframe and solid one-piece swingarm manufactured using Pivot’s Hollowbox construction method. There’s still a zero-stack tapered headtube, a 30.9mm diameter seat tube, and a PF92 bottom bracket shell. Pivot specs a custom BB from Enduro, which is designed to accommodate the larger 30mm crank spindle used on the Race Face and SRAM cranks that specified on the complete bikes. Though it’s a relatively standard size, it is different to Enduro’s off-the-shelf options, with hardened steel races and black oxide coated balls for durability, and a greater insertion depth for the cups. Just like the headset cups, Pivot builds the PF92 shell to a high tolerance to ensure everything is nice and snug, and allegedly, creak-free. Internal cable routing is new. Note the straight seat tube for deeper seatpost insertion. Photo: Jens Staudt. 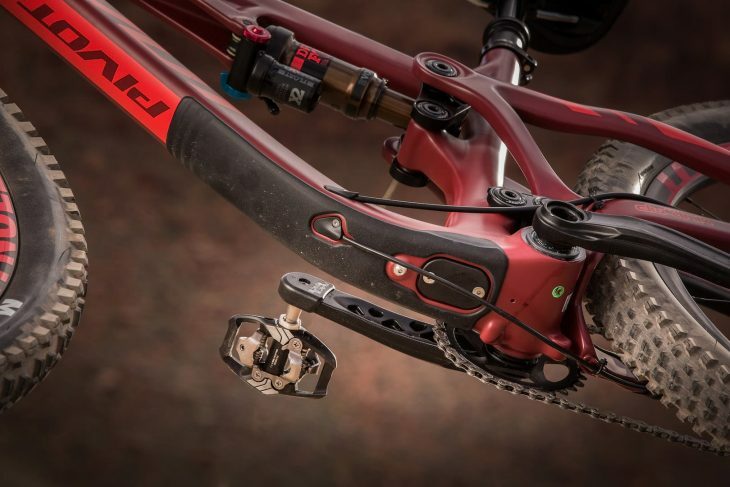 One change to the Trail 429 frame is the addition of internal cable routing, with bolt-on ports offering numerous configurations depending on your controls. The cable ports are drilled via a CNC machine, with the frame placed on a gimble in order to speed up the process. This keeps labour costs down, so despite the higher quality construction, pricing is pretty similar to the previous bike. Of note is the 2.9kg claimed frame weight (with shock), which is particularly impressive when you consider this bike has no maximum rider weight limit, and comes with a 10-year warranty. The Trail 429 is the first 1x specific trail bike from Pivot. Photo: Jens Staudt. It’s almost a given that a new trail bike in 2018 will be 1x only. But for Pivot, it’s still rather unusual. 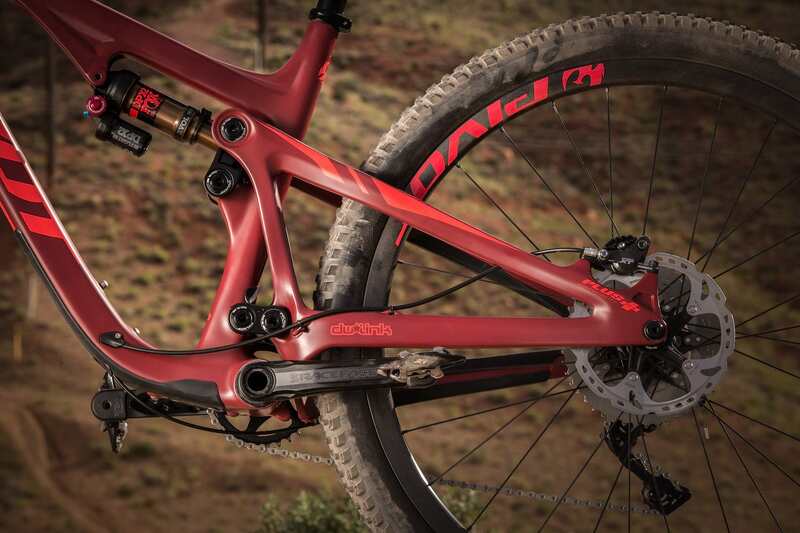 In fact, aside from the Phoenix downhill bike, the Trail 429 is actually the first Pivot to be 1x specific – all other Pivot models can fit a front mech. Chris Cocalis has a close working relationship with Shimano, having helped provide design input on various Shimano components such as the current XTR groupset and the Shadow Plus derailleur. 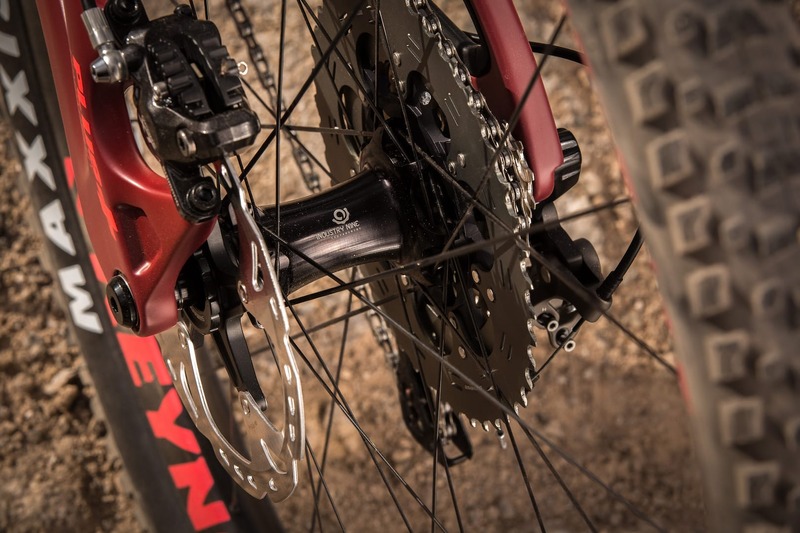 Given that relationship, Pivot has always ensured its trail bikes are compatible with Shimano’s high-tech Di2 and Side Swing front derailleurs. 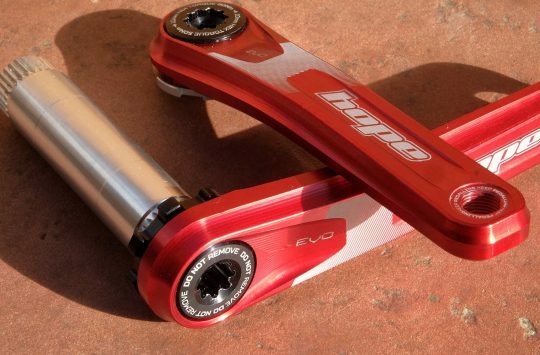 To some, it might seem like an unnecessary design feature given the dramatic rise in popularity of 1x drivetrain systems over the past five years, but Pivot has been bucking that trend for a good while. Cocalis explained that up until about two years ago, almost half the mountain bikes his brand was selling were fitted with front derailleurs. The lower dw_link is beefier and wider. Photo: Jens Staudt. 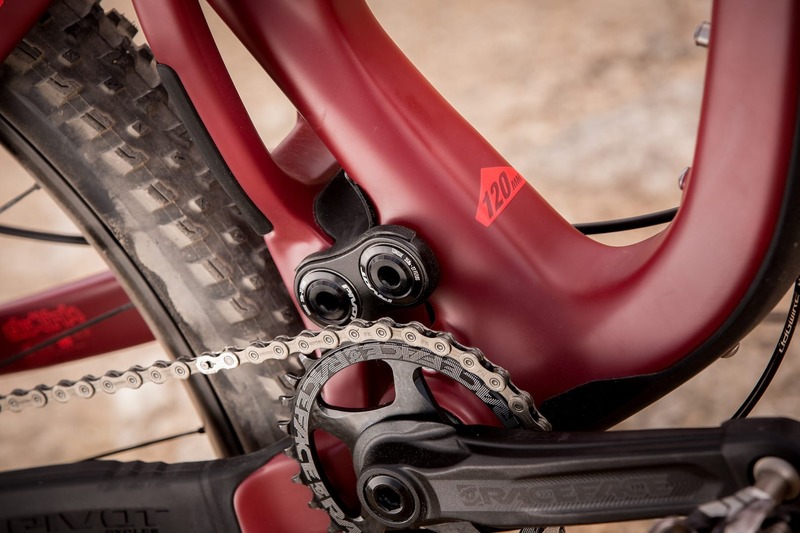 Then SRAM launched its Eagle 1×12 drivetrain. Within 6 months demand had changed dramatically, with Pivot’s sales of 2x build kits taking a hefty dive. Now we also have GX Eagle 1×12, and if the rumours are to be believed, Shimano will be launching a new XTR groupset this year that will tackle SRAM’s 12-speed drivetrain head-on. All of a sudden, the need to design a bike around a front mech has seemed less and less important. Going dedicated 1x for the Trail 429 has offered Cocalis and his engineering team several benefits. 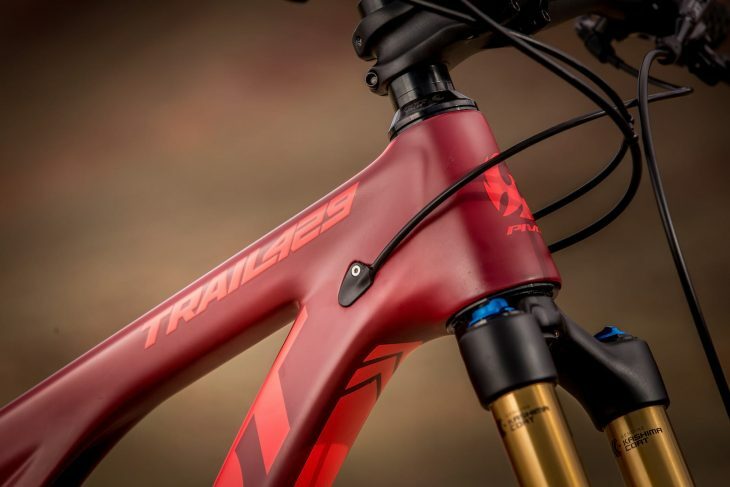 With fewer design constraints around the bottom bracket and chainstay yoke, the Trail 429 not only has more tyre clearance and a shorter rear centre, it also has a much stiffer swingarm. The lower suspension link is an inch wider to place the pivot bearings further apart, and drawing inspiration from Pivot’s longer travel bikes like the Switchblade and Firebird, the swingarm on the Trail 429 also features double upright stays. On aesthetics alone, it’s a bigger and burlier bike. 130-140mm travel up front. Photo: Jens Staudt. To match the new frame, Pivot has gifted the Trail 429 with a little extra squish. Up front you can fit a 130-140mm travel fork, though Pivot will be spec’ing all complete bikes with 130mm travel forks, and that’s what the listed geometry figures are based around. Out back, the rear suspension remains as a dw_link design, with two compact alloy linkages connecting the swingarm to the mainframe. Each link features large diameter Enduro Max cartridge bearings, which are the same size throughout for ease of replacement. Travel however, has bumped up from 116mm to 120mm. 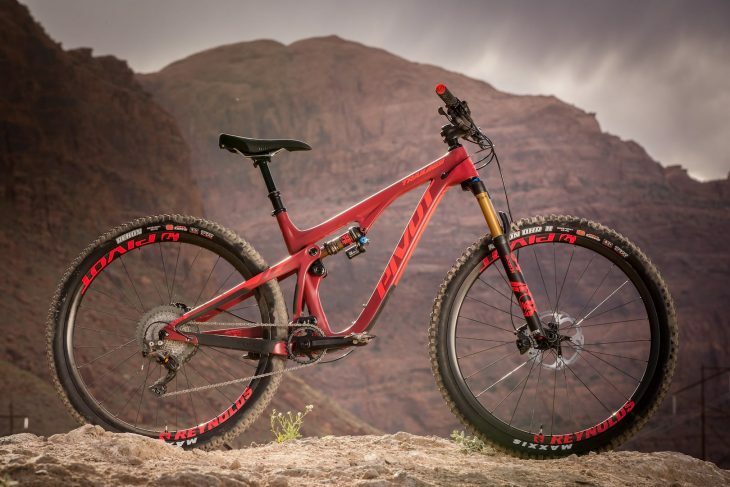 That doesn’t sound like a whole lot, but it does highlight the different approach that Pivot has taken with the new bike. The dw_link suspension design connects the one-piece carbon swingarm to the mainframe. Photo: Jens Staudt. Whereas the original Mach 429 Trail was derived from prototypes based around the 100mm travel 429, with the travel gradually increased until Cocalis and the team felt they had the right balance, this new guy has come from the other direction, and has been designed from the get-go as a 120mm travel trail bike. The suspension kinematics have been altered accordingly to provide a touch less anti-squat for a more neutral feel, with more usable travel through the middle and end of the stroke. Cocalis was keen to retain the poppy feel of the old bike though, with enough efficiency built-in so the rider can forget about handlebar remotes and flicking compression switches on the rear shock. 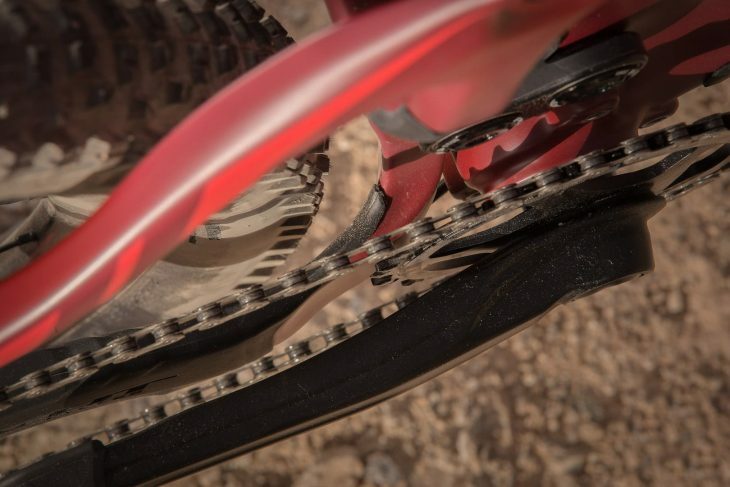 Part of the improvement comes from the 1x specific frame design, which meant the suspension kinematics could be optimised around a 30-34t chainring, rather than having to account for a double setup. Float DPX2 shocks will be an upgrade option. Photo: Jens Staudt. 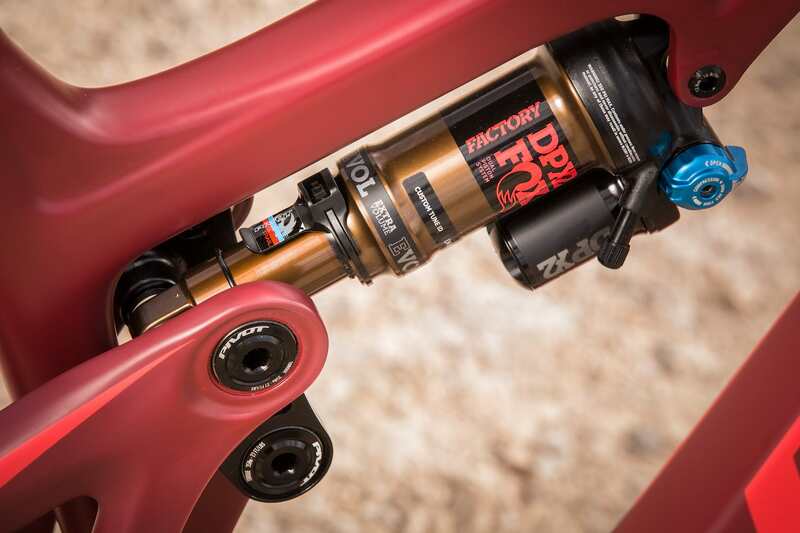 The Trail 429 will come standard with a Fox Float DPS shock as standard, though riders can upgrade to the DPX2 shock if they’re after a little more damping control for riding longer descents. The shock body measures 190x45mm, which makes this the first Pivot bike to be built with a new-school Metric shock. You won’t find trunnion or bearing mounts on the Trail 429 though, since there were no packaging or performance benefits to necessitate using anything other than a regular shock. 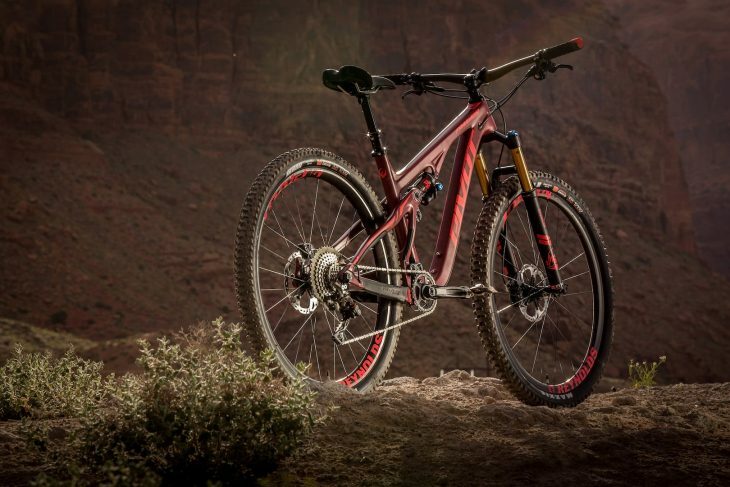 Though there’s a bunch of geometry alterations to the Trail 429, perhaps the most exciting for shorter and/or younger riders is the addition of an Extra Small size. 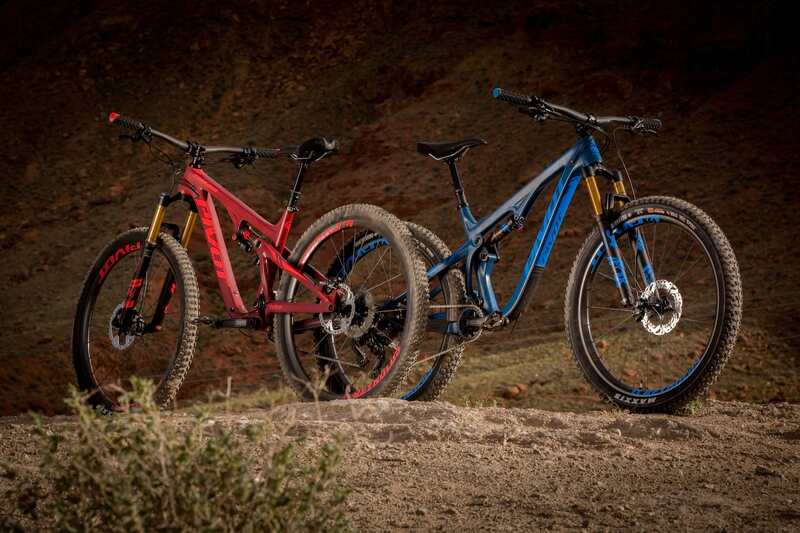 According to Pivot, that means riders as short as 4’11” will be able to fit onto the Trail 429, which is damn impressive considering the amount of travel and its chubby rubber capabilities. Even more impressive is that the XS frame size, with its super low 66.8cm standover height, will still fit a full size water bottle inside the mainframe, just like every other frame size. Room for a water bottle in every frame size. Photo: Jens Staudt. Because the geometry was already quite progressive on the Mach 429 Trail, Pivot hasn’t had to go overboard with the new Trail 429. The head angle has slackened a hair to 67.3°, while the seat angle is kicked forward to 74°. The reach measurement is the biggest change, with each frame size growing 20-30mm, mimicking the dimensions of the current Mach 5.5 and Switchblade. The medium size that I tested boasts a healthy reach of 440mm, which, combined with the slightly slacker head tube angle, results in a boost to the overall wheelbase length, even though the chainstays have been tucked in by 14mm to 429mm. I should note that all of these figures are based around a 130mm travel fork. So expect the numbers to kick back just under half a degree when using a 140mm travel fork. For the cockpit, Pivot has designed each frame size around a 45mm long stem and 760mm wide bars – except for the XS size that gets a smaller 35mm stem and narrower 740mm bars. The low-rise handlebars come fitted with WTB Padloc grips, which have a soft wedge on the outer end that requires an angled cut to the handlebar. The Padloc grips actually grows the total bar width to a little over 770mm. The 760mm wide bars end up being a little over 770mm with the WTB Padloc grips. Photo: Jens Staudt. Though the Mach 429 Trail was the first Pivot model to be 27.5+ compatible, Cocalis admits that it wasn’t totally optimised around plus tyres. That said, the 27.5+ setup still made up for around a quarter of total sales, which meant it was important to ensure the new bike could also take chubby rubber. With more clearance available in the back end, the Trail 429 will now take up to a 29×2.6in or a 27.5×3.0in tyre. 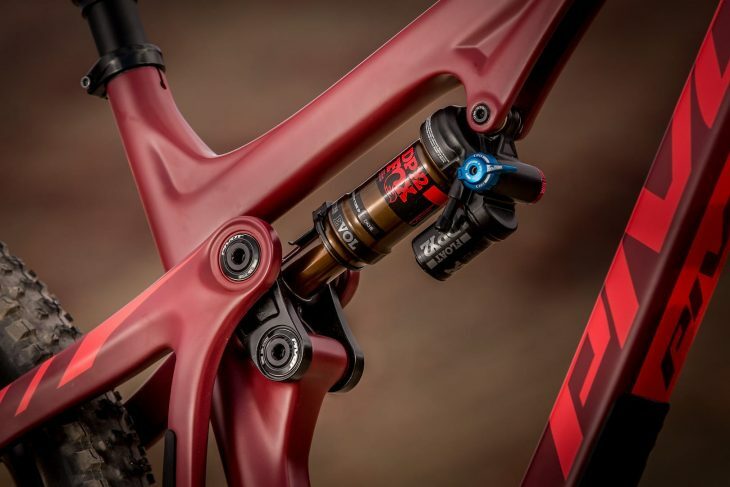 For running the plus setup, a 17mm lower headset spacer (included in the box with each bike) can be installed in order to maintain the same bottom bracket height when switching between wheelsizes. Alternatively, you can also run this spacer with the 29er setup to slacken off the angles – just like running a longer travel fork. Run 29in or 27.5+ wheels with the Trail 429. Photo: Jens Staudt. There’s certainly a lot of improvements going on with the new Trail 429, but in order to line up all its ducks in a row, Pivot says it needed to employ Super Boost Plus rear spacing. This 157x12mm rear hub varies in its design to a standard downhill hub, as the hub flanges are pushed further apart in order to provide a better spoke bracing angle for increased rear wheel stiffness. The wider hub also pushes the cassette further out from the hub centre line, so to match that the chainring is pushed out too. On the models with Race Face cranks, the chainring is simply flipped to increase the chainline to 56.5mm, without affecting Q-factor. 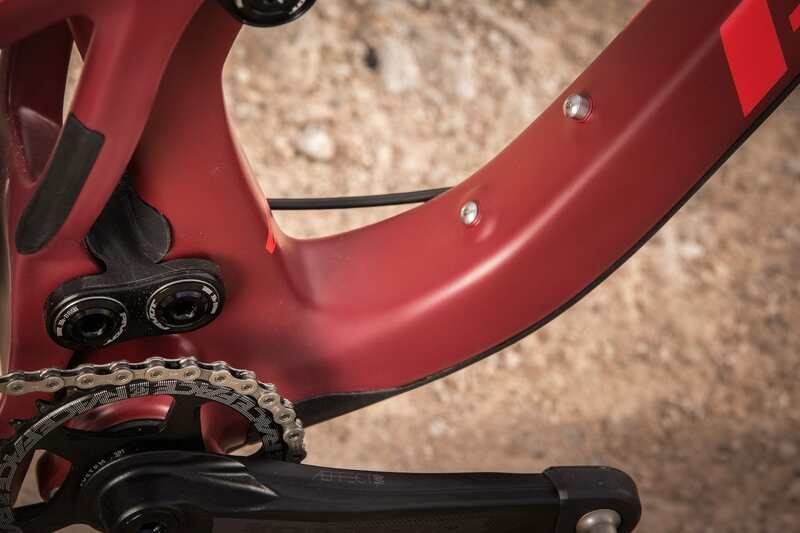 On the SRAM models, a OneUp chainring is fitted to do the same thing. And so with the chainring further out there’s more room around the BB junction and the chainstay yoke, and that’s helped to keep the rear centre nice and short while still having room for a 3.0in wide tyre. Super Boost Plus spacing sees a 157x12mm rear hub. Photo: Jens Staudt. A glance at the swingarm on the back of the Trail 429 shows just how much shaping and profiling has gone in to making all of these things happen. And even though there’s that big 157mm wide hub in the back, the Trail 429 actually has more heel clearance than the Mach 429 Trail it replaces. Still wondering what the hell this Super Boost Plus thing is? 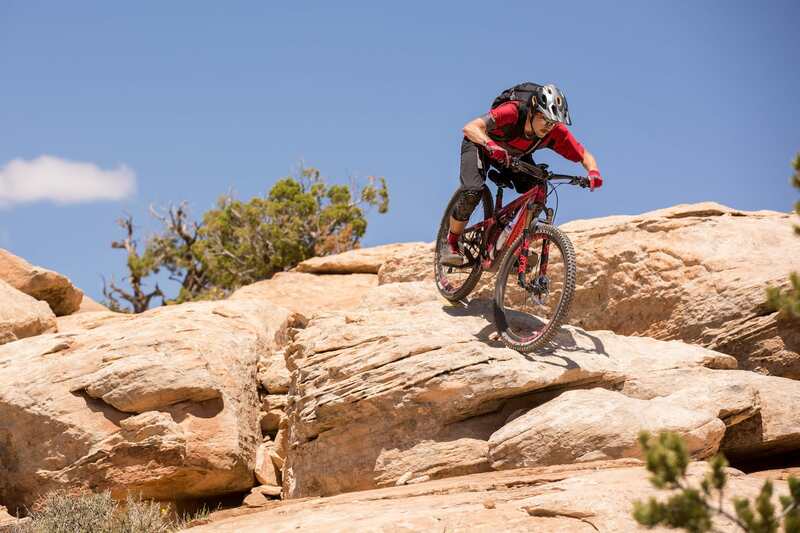 You might be surprised to hear that it was actually introduced two years ago on the Pivot Switchblade, and since then some other brands, including Knolly Bikes, have been adopting the same standard. You can read more about it in more detail here. More clearance for big tyres. Photo: Jens Staudt. Because of the Super Boost Plus rear hub spacing, like the Switchblade, Pivot will only be selling the Trail 429 as a complete bike. It’ll only be available in carbon fibre, with no plans to produce an alloy version. For now anyway. There’ll be eight spec levels available across both 29in and 27.5+ wheelsizes, starting at £4,749 and going up to £8,249. 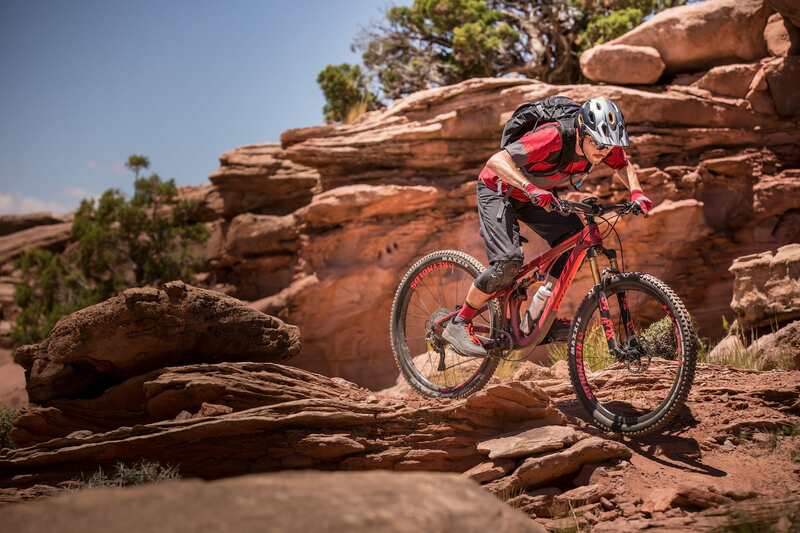 The bike I rode in Moab was the mid-level £5,749 Pro XT/XTR model, though there were a few tweaks from the stock spec, which included Race Face Aeffect alloy cranks and Reynolds Enduro 29 carbon wheels. You can check out the full spec list down the bottom of the page, but highlights include the slick-shifting 1×11 Shimano drivetrain, a smooth-sliding KS LEV dropper post with its ergonomic Southpaw lever, and the superb Fox Factory suspension package. The WTB Vigo saddle is a comfortable perch for the Trail 429. Photo: Jens Staudt. Of note is that the UK spec will be coming with a Minion DHR II tyre both front and rear, rather than having the Rekon out back. Regardless, all spec levels will be coming with 30mm wide rims and 2.4in Wide Trail tyres. Unfortunately I didn’t have a chance to weigh the bike at the launch, though my well-calibrated arm scales suggest it’s probably somewhere around 12.5kg at a guess. 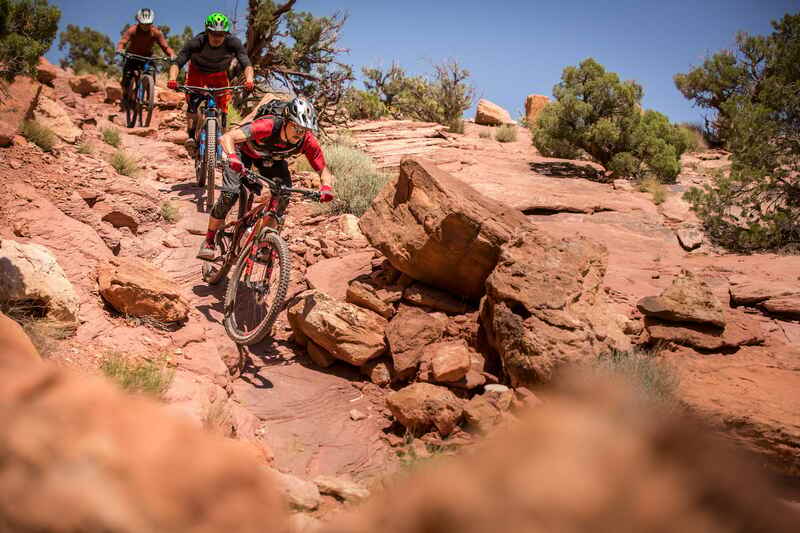 So I’m going to be upfront about this – I was very, very excited about riding in Moab before this launch. Though I’ve been mountain biking for well over 20 years and have visited some incredible destinations in that time, I still hadn’t been to Moab before this trip. As such, I was absolutely frothing to experience the singletrack that I’d heard so much about. Honestly, I could have been given some rollerblades to ride with and I probably still would have had my mind blown. Being the professional I am though, I put my childish enthusiasm to one side to focus on the task at hand – testing the Trail 429. The general plan for the launch was to arrive on Sunday night, get all our bikes setup in the evening, then setoff early doors to get onto the trails before the midday heat hit us too hard. Then for the afternoon we’d head back to the apartment to get the full technical rundown on the new bike. The idea being that we could test the bikes without any preconceptions influencing our early impressions. The rocks grow rocks here in Moab, Utah. Photo: Jens Staudt. The ride itself was to be a 33km point-to-point haul with over 1000m of descending, and a tonne of technical climbing and pedalling in between. We’d be taking the Trail 429 on several trails including Mag 7 and Portal, which I was informed had some pretty sketchy sections, including a highly exposed cliff-face section where riders have literally fallen to their deaths before. Because Moab’s terrain is so rocky and demanding, tyre pressures were set for us a little on the firmer side. I had 23psi in my front Minion DHR II, and 26psi in the Rekon out back. Even with the high pressures though, I still managed to cut open the rear tyre on a particularly nasty impact that put a cut in the centre of the tread, and just above the bead near the rim. I also gave the carbon Reynolds rim a decent scuff on one of the beads in the process. An inner tube buffered by an energy chew packet got me rolling again, but I’d certainly be considering a Maxxis Double Down casing tyre if I were to come back and spend some more time riding here. The rocks like eating tyres. Conversely, the suspension was setup on the plusher side to handle the slickrock. To support my 70kg riding weight, I had the Fox 34 fork set at 30% sag, with 72psi and 7 clicks of rebound from full slow. Normally I’d run the 34 fork with a bit more low-speed compression damping, but to keep it reactive for the constant rocky onslaught, I backed that off to around 3-4 clicks from wide open. Thanks to Pivot’s nifty clip-on sag guide (why can’t more brands do this? ), setting the rear shock pressure is a doddle. 180psi was what I needed to hit the red ‘Trail’ line on the guide, and I set the rebound one click faster than halfway. Rear shock setup is easy with Pivot’s clip-on sag guide. Photo: Jens Staudt. While we only had a day’s worth of riding aboard the Trail 429, thanks to the demanding terrain, a few things became very clear early on. Firstly, this bike pedals incredibly well. That’s hardly a surprise, given that most Pivot full suspension bikes are endowed with well-behaved suspension. Even with the suspension set wide-open, there is so little bob from the rear shock that it’s a wonder why it even comes fitted with a compression lever. Whether you’re meandering along on the flats, or punching the pedals out of the saddle, the Trail 429’s back end remains completely unfazed. This bike loves technical climbing. Photo: Jens Staudt. The efficient pedalling was particularly noticeable on the more technical ascents on our ride, where short, stabby power moves were required in order to pop up and over big slabby rocks laid out in front of me. The stiff frame works in tandem with the dw_link suspension to mitigate energy loss, ensuring more of your pedal power makes it to the sticky Maxxis Rekon tyre. It also helps that the Trail 429 is an easy bike to move about on, with the short chainstays allowing you to pop up the front wheel with ease whilst thrutching from one boulder to another. The Trail 429 is an easy bike to cut shapes on. Photo: Jens Staudt. 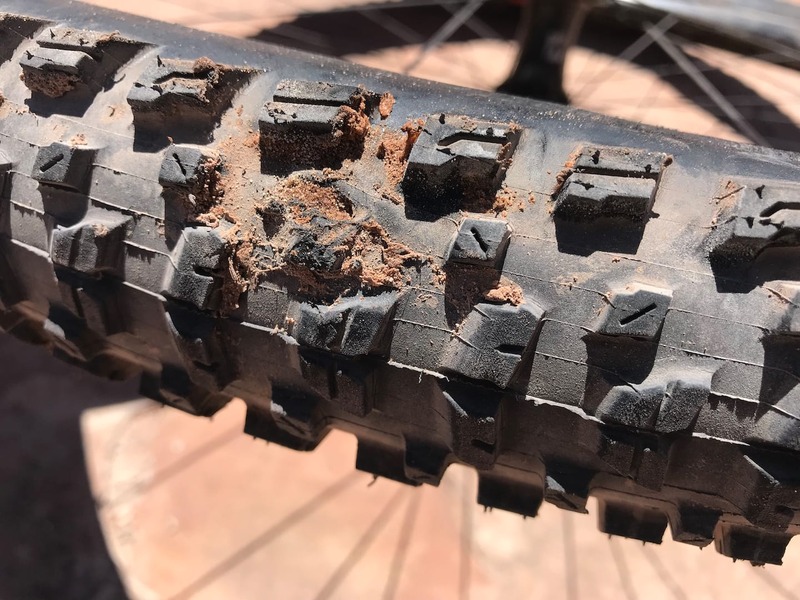 The earlier portion of the Mag 7 trail network gave us the opportunity to test the Trail 429’s cornering abilities on slightly smoother and flatter terrain, and I’m happy to report that the bike made short work of being dipped down and pushed through each and every one. The excellent Minion DHR II is a superb tyre for leaning over hard on almost any trail surface, and it provides a tonne of dependability to the front of the Trail 429. Out back, the short and stiff back end is highly responsive to steering inputs through the pedals. 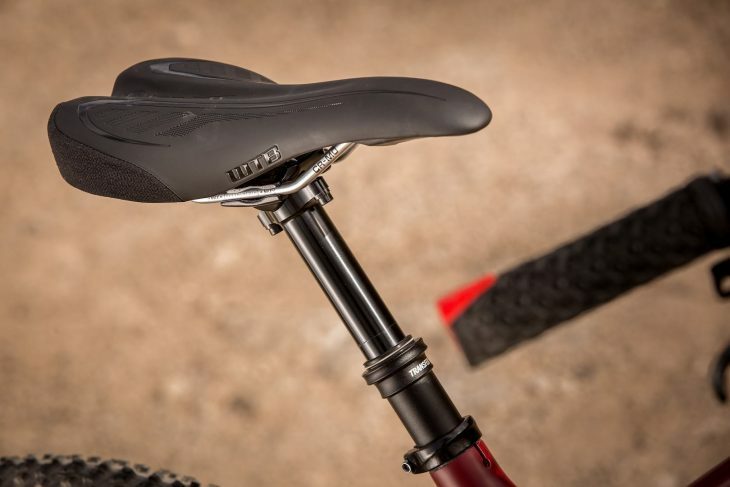 With the saddle compressed out of the way, you can squat nice and low and push your weight through the BB to guide the bike through the turns, keeping a light touch on the bars. Overall, it’s the Trail 429’s balanced weight distribution and ‘just right’ cockpit that makes it feel so easy to distribute weight onto the tyres as needed. Pivot has clearly spent a lot of time ensuring all of those details come together on the trail, and I never felt like I wanted a wider bar, or a different length stem, or a lower BB. Quality rubber and a sorted chassis help the Trail 429 fly through the turns. Photo: Jens Staudt. Though devotees to the church of Ultra Slackiumism may be bummed to see a head angle steeper than 67° on paper, in practice it is absolutely perfect for this bike. 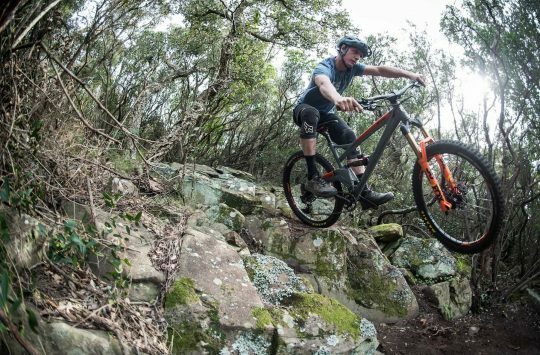 The longer reach has increased the Trail 429’s front centre as it is, so there is a real and noticeable boost to high-speed stability, but it hasn’t come at the expense of agility in tight and techy trail scenarios. This was no more apparent on the middle stages of Mag 7, where making on-the-fly steering corrections meant the difference between finding the smooth line, or wiping out the front wheel completely. 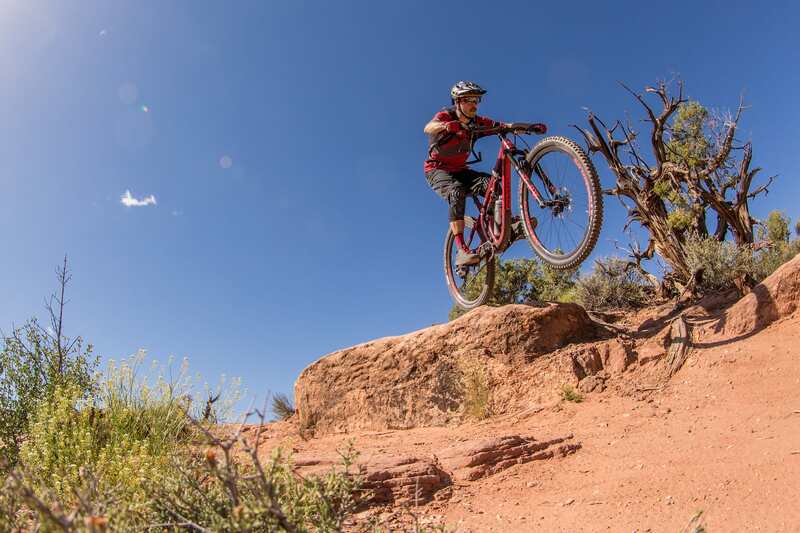 And when blind rollovers actually turned out to be drop-offs, an unplanned tug of the grips at the last minute would see me fly off the ledge both wheels in the air, before landing safely a few feet down the trail. Just tug on the bars and let it fly. The Trail 429 has your back. Photo: Jens Staudt. As for descending, well, we couldn’t really have ridden the Trail 429 in any more demanding terrain than on the final section of Portal that took us back down to the valley floor. This unrelenting rock-fest saw me repeatedly use the entirety of the bike’s travel, though despite the arse-clenching impacts where I could hear my poor rear rim push through the tyre casing (with a magnificent “KER-THUUUUNG!” each time), I never once felt the rear shock bottom-out heavily. Though we were on trails that would have been better suited to something like the Switchblade or Mach 5.5, it was impressive how stable the Trail 429 chassis remained even when both dampers were well past their limits. There was definitely no sensation of harshness, discomfort, or being out of control. Aside from the cut rear tyre, I didn’t have too many issues with the Trail 429 test bike. The rear Shimano XT brake exhibited an inconsistent lever throw during one extended downhill section, which could have simply been due to air in the line, or Shimano’s variable bite point issue rearing its ugly head. The WTB Padloc grips have a sticky high-traction pattern, but even with gloves I found them to be pretty rough on my hands. I had elected to use the slimmer 28mm diameter profile option, which was nice and tactile, but personally I’d look at swapping these out for something less cheese-grater-ish. It’s an efficient trail bike that punches well above its weight. Photo: Jens Staudt. As far as riding locations go, Pivot really couldn’t have chosen a more rigorous environment to test out the new Trail 429. Cocalis made it clear that he didn’t just want us to ride it on groomed machine-built singletrack to flatter the bike though. Instead, he wanted us to take the bikes onto highly technical trails to show how it performed at the outer limits. 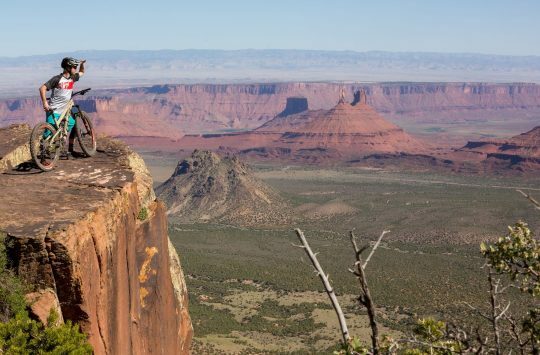 It might just be a coincidence that Moab is one of his favourite places in the world to go riding. Certainly for a 120mm travel bike, the Trail 429 rides well beyond expectations. Its high quality chassis and suspension design can handle a wide range of demands, and a well-thought out component package ensures that you’re able to squeeze the most out of it. Personally, I’m chomping at the bit to get the Trail 429 onto UK soil to test it on a wider variety of terrain – including actual soil – because early impressions on the slickrock are positive. It’s an efficient and technically proficient climber with great balance and perky handling, which should make it an ideal option for long distance XC and trail rides where comfort and playfulness are the priorities. With versatility in spades, the Trail 429 has a very broad appeal. Photo: Jens Staudt. Smores and brews? The Solo Stove does both! If you had to choose 429 Trail vs. Mach 5.5? @johnnyutah97 – That’s a great question, but unfortunately it’s one I can’t answer fully as I’ve not ridden the Mach 5.5. 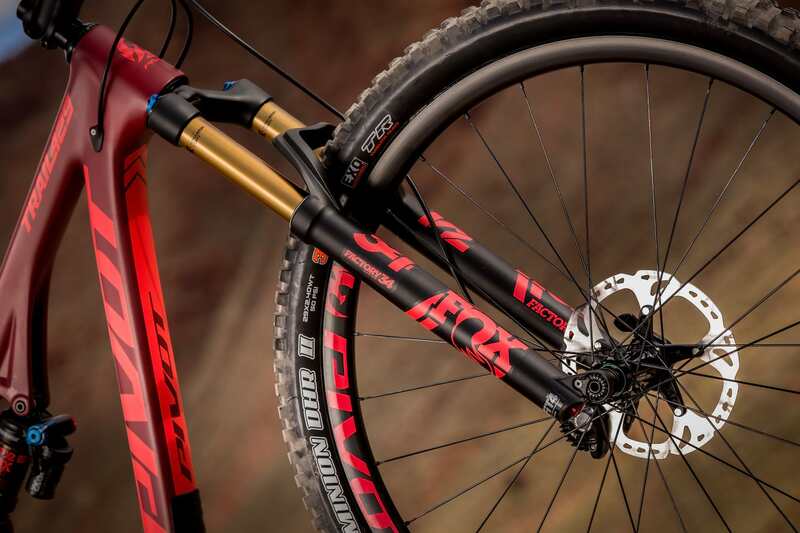 However, I think it’ll come down to what sort of riding you like doing – the Trail 429 is a shorter travel trail bike with 130/120mm travel, while the Mach 5.5 is a burlier trail/AM bike with a bigger Fox 36 fork and 150/140mm travel. Personally? I gelled really well with the Trail 429, and I like its versatility. I also have very few issues with 29in wheels, and to me, they present more benefits than negatives. We also rode some pretty bloody techy trails on the launch, and the bike felt planted. Short of competitive enduro racing, I reckon the Trail 429 is capable of a lot, while being a better option than the 5.5 for all-day trail riding, and occasional dabbles in marathon/endurance racing.